BROSSARD, Que. — On a day when Quebecers headed to the polls to elect their new leaders, there was no vote needed for the Montreal Canadiens to select their new captain. The decision to give the "C" to all-star defenceman Shea Weber was "unanimous." 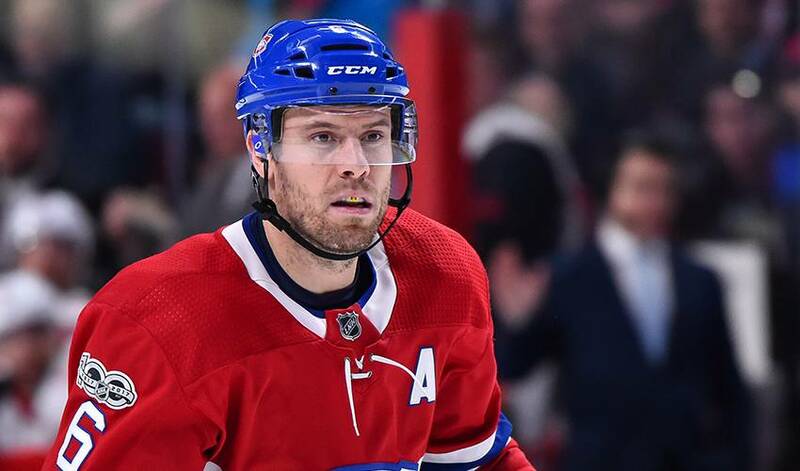 Weber, who underwent off-season knee surgery and isn't expected back in the lineup until at least December, was named the 30th captain in team history at the Bell Sports Complex on Monday afternoon, with Paul Byron and Brendan Gallagher named alternates. Gallagher was a popular candidate among fans to become the next Canadiens captain, but management opted for the two-time Olympic gold medallist instead. "It really is an honour," Weber said. "I don't know if you can put it into words. I don't know how many times you can say it's an honour. You look at the guys in our dressing room, guys who have worn this letter in this organization's history. It's special." General manager Marc Bergevin and head coach Claude Julien discussed Weber as captain following the trade of former leader Max Pacioretty to the Vegas Golden Knights. It's a change in style from 2015, when a players vote resulted in Pacioretty becoming captain. "I think it's pretty obvious when you look at (Weber) as a person," Canadiens head coach Claude Julien said. "Players gravitate to him. He's very open to bringing players to his house for meals, young players that don't have someone cooking for them. He's really been great at that." Bergevin added that he got the "feel" from the locker room as well and felt a vote was not necessary to decide a captain this time around. "The choice was obvious," Bergevin said. "The players all feel the same way. We all feel the same way that Shea is the right guy to lead this team. We didn't want to wait. Training camp is over, season starts on Wednesday. Today was the perfect day to make the announcement." This isn't the first time Weber's been given a great deal of responsibility. Prior to joining the Canadiens during the summer of 2016, Weber spent six seasons as captain of the Nashville Predators. The defenceman was 24 when he was named the youngest captain in Predators history during the 2010 off-season. "I was a young captain. So I learned a lot through the years and I'm not going to change who I am or what I value," Weber said. "But I definitely learned from my experience and that's going to help me as we go forward,"
The Sicamous, B.C., native is already looked as a parental figure in the Canadiens locker room — he confirmed that some players do call him "Dad" — and has no problem taking younger players under his wing. "I think everyone on the team is as important as the next guy," Weber said. "I think the biggest thing is to make everyone feel that way. Whether you play two minutes or 25 minutes, you're going to make a difference at some point throughout the season or in the playoffs." Despite the new responsibility, Weber won't be suiting up in a Habs uniform until mid-December at the earliest. The veteran is still recovering from off-season knee surgery. Weber is also coming off foot surgery, having missed 55 games last season due to injury. "As far as doing as many things as I can for the team, I'm going to stay as involved as I can," Weber said. "Been around training camp around the guys. Proud of the way they've responded this year, coming out ready to go." The Canadiens will practice Tuesday morning before their home opener Wednesday night against the rival Maple Leafs at the Scotiabank Centre in Toronto. NOTES: Following the press conference, The Canadiens acquired defenceman Brett Kulak from the Calgary Flames in exchange for Rinat Valiev and Matt Taormina...The Habs assigned Michael Chaput and Kenny Agostino to the Laval Rocket after they went unclaimed on waivers...Montreal also offered Simon Despres an American Hockey League contract, but says he's "considering his options."